Way back in December 2013, Rockstar wrote on its company blog about "substantial additions" coming to Grand Theft Auto 5's single-player mode. Those additions (substantial or otherwise) never materialized, and fans were left wondering what happened. In a recent interview with Game Informer, Rockstar director of design Imran Sarwar laid it all out - though how you feel about his answer may depend on how much you like GTA Online and how much you're looking forward to Red Dead Redemption 2. "It was not really a conscious decision, it’s just what happened," Sarwar said. 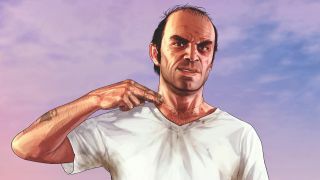 He called the existing GTA5 campaign "absolutely massive and very, very complete" before outlining three issues that he says prevented Rockstar from moving forward with expansion plans. For starters, there was the move from PS3 and Xbox 360 to PS4, Xbox One, and PC, which Sarwar said ate up time and resources. Improving and expanding on GTA Online was also a major effort, and the studio split a large portion of its crew to work on the upcoming Red Dead Redemption 2 as well. "The combination of these three factors means for [GTA5], we did not feel single-player expansions were either possible or necessary," Sarwar said, "but we may well do them for future projects." If this sounds a bit familiar, Sarwar told IGN back in 2015 that "Grand Theft Auto Online changed the flow of development from what we were traditionally used to, which has been a learning experience for everyone. ... GTA Online has proven too interesting and too important to be separate from the main mission of the entire team". This new interview is the first time he's explicitly said that the studio chose to focus on multiplayer content over single-player additions, however. Judging by comments, the playerbase is fairly split on this. Some call BS and say Rockstar only cares about milking GTA Online players while putting in minimal effort, while others say they're glad that focus went to things like Red Dead Redemption 2. I'm curious though: with GTA5 single-player DLC officially dead and not going to happen, are you satisfied with Sarwar's justification?